(Los Angeles, Calif…May 16, 2012) The Gracie Worlds will continue to set the standard for Jiu-Jitsu and Grappling tournaments when they make their San Jose debut in conjunction with California’s premier fitness event, TheFitExpo™, Saturday and Sunday, July 14-15, 2012 at the San Jose McEnery Convention Center, 150 West San Carlos, San Jose in Halls 1 & 2. Gracie will once again work with the TheFitExpo to create the ideal environment and venue for a top-notch competition. TheFitExpo is bringing industry leaders together for a weekend of Jiu-Jitsu, Mixed Martial Arts, fitness challenges and much more. 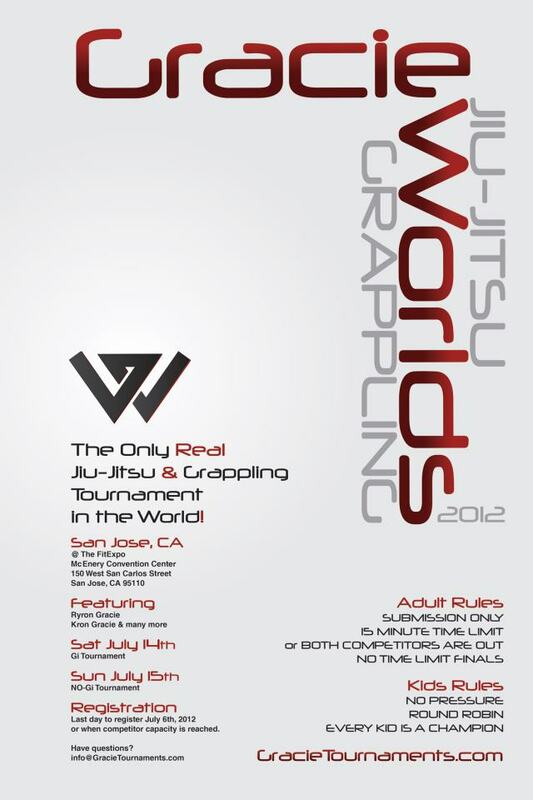 Registration for adults and kids to compete in The Gracie Worlds ends on July 10, 2012. More information can be found at www.gracietournaments.com. TheFitExpo adult tickets, which include admittance to all the competitions including The Gracie Worlds, are $20 per day or $30 for the full weekend. Children 12 years and under are $10 per day and children 6 and under are free. Show hours are Saturday, 10:00 AM – 6:00 PM and Sunday, 10:00 AM – 5:00 PM. Plenty of parking is available. For more information on TheFitExpo ticketing, exhibiting or sponsorship opportunities, call (818) 545-0290 or visit www.thefitexpo.com. Event is produced by National Fitness Productions, presented by Bodybuilding.com and sponsored by Subway Restaurants, MET-Rx, Gaspari Nutrition, Pure Protein, Body Fortress, Iron Man Magazine, MMA Worldwide, Ironmind, Sherdog and Hit What’s Hot.